Pupils in four schools in Westhill (Crombie Primary, Elrick Primary, Skene Primary and Westhill Primary) were asked by the local Grampian Police schools liaison officer to design posters which would highlight anti-social behaviour problems in and around Westhill and help to reduce them. In recognition of their contributions to beating anti-social behaviour, each school was given a cash award of £50 for school funds by the Garioch & North Marr Community Safety Group. "As tackling vandalism is one of the safety group's priorities we are pleased to support this initiative promoted by PC Alex Carnie of Grampian Police. This project not only highlights a serious social problem it provides an opportunity for encouraging pupils in the Westhill Primary schools to consider ways of tackling vandalism. "What was also impressive is the artistic ability of the children which is outstanding and we congratulate them for their creativity. These posters will help us to promote our campaign in tackling vandalism. Our thanks to the pupils and to the teachers for their participation." "This was an excellent initiative which proved a worthwhile follow-up to inputs that each school received on the subject of vandalism. It gave the children an opportunity to display their thoughts on the subject and how it affected their community. These posters will be displayed prominently around Westhill to raise awareness amongst the community as a whole. I would also like to thank the Garioch & North Marr Community Safety Group for their support of this initiative which was very much appreciated, not just by myself but also by the schools." The role of school liaison officers is to interact with the schools to reduce substance abuse, vandalism, road casualties etc. 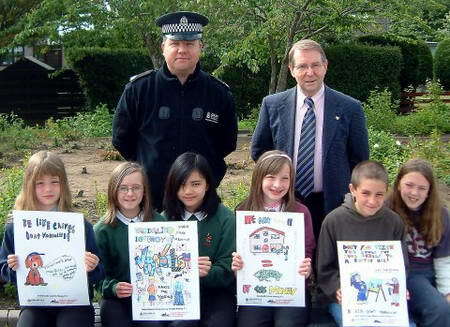 The winners of the poster competitions from the four Westhill primary schools with PC Alex Carnie of Grampian Police and Ron McKail, Chairman of the Garioch & North Marr Community Safety Group. The winning posters, one from each school, highlighting the pupils' concerns, are shown below. The winning Crombie Primary poster. The winning Elrick Primary School poster. The winning Skene Primary School poster. The winning Westhill Primary School poster.